Gettysburg Ghosts. Paranormal Hot Spots In Gettysburg,PA. Are you interested in Gettysburg ghosts? If you answered “yes”, I am not surprised. Several individuals from around the world have an avid interested in the ever-popular haunted Gettysburg. This area serves as a historical landmark of the point in which the Civil War transitioned from what appeared to be a lost cause, to a cause with closure. Unfortunately, the battle was a gruesome one. It has been documented that over 50,000 individuals met their fate in the war that took place. Today, it is believed that thousands upon thousands of souls still linger on the battle fields, and several other areas in this location. Here, you will be introduced to several Gettysburg ghosts. 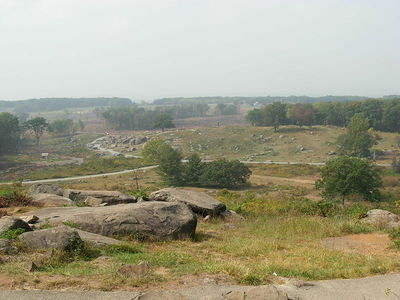 When discussing haunted Gettysburg, the first image that pops in everyone’s head is that of the battle fields. Over 50,000 individuals met their bloody and traumatic death on the land that served as the main location of the Civil War of the Americans. In the year of 1863 on the first day of July, a great battle began in Gettysburg when a group of Confederate soldiers entered the town of Gettysburg with the intention of occupying it. However, as they entered the town expecting only minor resistance they were taken completely off guard by a group of Union soldiers who were already occupying the town. The soldiers engaged in battle beginning at approximately 8.00am which led to the three days of brutal fighting that would later become well known as one of the most famous battles in American history - "The Battle of Gettysburg". Today, there are stories surrounding the battle fields that state that several spirits have been seen lingering around in the wooded area, as well as on the fields! Many have reported hearing cries that sound extremely mournful, as well as sounds that indicate the terror of the time in which the battle took place. Several indicate that this is simply an area with a residual type haunting going on, or a recording of events that happened in the past. However, there are still several that believe that there are intelligent Gettysburg ghosts lingering around the field. Farnsworth Bed and Breakfast is located near the area where the Gettysburg Battle took place. To this day, there are indentions in the wall that is located to the south that reflect where a bullet penetrated the exterior surface. As a matter of fact, there are several of these. Those that visit this particular place in haunted Gettysburg report that there are several Gettysburg ghosts that seem to haunt the structure – both inside of it, and outside of it. The structure that serves as the Bed and Breakfast was actually constructed in the year of 1810. While it initially served as a home, during the ever-popular Civil War, the soldiers on the confederate side actually took the home over. 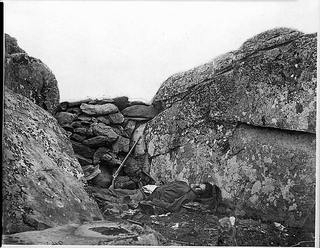 While civilians of the time were permitted to live and resume their lives during the Battle of Gettysburg, it is believed that one civilian died. This was a lady by the name of Jennie Wade. It is believed that one of the soldiers that took refuge in the attic of the structure that now serves as Farnsworth Bed and Breakfast actually killed this lady in her home, which was just a short distance away. When it comes to haunted places in the United States, or more specifically, haunted inns, this particular structure is ranked within the top ten. As stated previously, Jennie Wade was murdered by a bullet that emerged from the Farnsworth structure. To this day, there are several different hauntings that have occurred in the home. It has been reported that a female is seen baking bread, and that the bread can actually be smelled relatively strongly in the home. It is believed that this is Sarah, a sister of Jennie Wade. This lady was also known for wearing perfume that was scented in a floral scent that resembled the fragrance of roses. Today, this is also still smelled in and around the structure. If you are in this structure, it is very likely that you will experience the sound of children playing, and various little incidents that reflect that of children playing. Devil’s Den is believed to be a group of rocks where the infamous Native Americans once hunted. Many attest to the fact that they can still hear the sounds of the Indians and that, on occasion, these individuals can be seen in spiritual form. Many who reflect on the history of our nation indicate that various unusual events took place in Devil’s Den – like strange and unusual ceremonies. It is believed that this area was blessed by the Native Americans, and protected by them as well. As a result, it is believed that the spirits of these Indians still remain over the land, ensuring that it is well cared for. If you are looking for haunted places to go, Gettysburg offers a large variety in haunted places. The areas mentioned here are considered to be the best of the best when it comes to Gettysburg ghosts. You should arrange your trip to haunted Gettysburg today so that you too may experience these locations for yourself! Check for directions, hotels, attractions, view photos, and read the reviews and traveler tips for the city of Gettysburg, Pennsylvania!